No discussion of the Roswell incident would be complete without discussing other possibilities about what might have occurred at Roswell Army Air Base the first week of July, 1947. In July 1997, on the fiftieth anniversary of the Roswell crash, the Air Force announced one final explanation for the sightings of alien bodies by private citizens. First, it' s interesting to note that the Air Force was the branch of the military chosen to announce this. In July 1947 the United States Air Force didn' t exist! It had not yet been formed as a separate branch of the military. Roswell was an army air base. In fact, some historians claim that one of the reasons the existence of flying saucers was kept secret in 1947 was because the military was right in the middle of getting congress to approve the Air Force as a separate branch and didn't want flying saucers to hold it up. 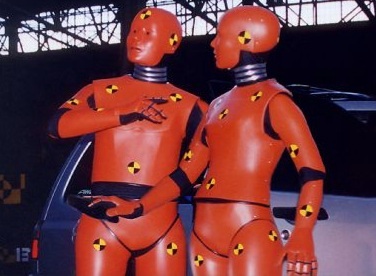 The Air Force claimed the alien bodies civilians saw were really crash-test dummies dropped by parachute. Such tests did occur starting in 1953, according to the Air Force' s own records. The Roswell crash occurred in 1947. We have a decade problem. The first of these full-sized dummies was dropped six years after the Roswell crash. Without belaboring the point, suffice it to say there are dummies involved. The dummies are either the Air Force officials or you. This time you get to choose. In 1994 the Air Force announced they had gone back and looked at their records regarding Roswell. They concluded that the debris Mac Brazel found was a weather balloon, part of a project called Project Mogul. Project Mogul was a series of unmanned balloon flights. Those participating were told the purpose of the project was to maintain the balloons at a constant altitude in order to monitor weather conditions. Decades later it was learned that the true purpose had been to monitor any attempts the Soviet Union might make to detonate a nuclear device. These balloons consisted of an array, or many balloon-like objects tethered together. Some of them were quite long, stretching out over five hundred feet. Past records show a number of these were being launched during the time the Roswell affair happened. Virtually all the balloons launched at that time were reported as recovered or located. One flight, Flight 9, remains unaccounted for. There are no records saying it was unaccounted for, there are simply no records. They have been lost. The amount of debris found far exceeds the amount of debris that would be left by a Mogul balloon array, even a 500-foot-long array. The behavior of the military. Even though Project Mogul was classified, the kind of threats received by civilians went far beyond the restrictions imposed upon civilians for any other classified project in United States history. Even the development of the atomic bomb did not result in civilians and children receiving death threats. The testimony of dozens of high-ranking military officers who saw weather balloons and Project Mogul balloons everyday, and who stated quite clearly that the debris they handled was not a weather balloon, and was not like any other material they had ever seen on earth. It is true that some captured German V-2 rockets were being launched and tested at nearby White Sands Proving Grounds. This facility is about a hundred miles from Roswell. In fact, one of the V-2s was launched and then crashed across the border in Mexico on May 29, 1947. However, the episode was announced and carried in all the newspapers. Official press releases were handed out. No secret was made of the event. On July 3, 1947, a V-2 launching was scheduled. However, an accident occurred on the launching pad and seriously injured several people. So the July 3 launch was cancelled. Newspaper accounts of the event and statements of the White Sands base commander Colonel Turner confirmed the launch cancellation. Not one person in the military has put forth a hypothesis that it was a V-2 rocket found on Mac Brazel' s ranch in July. During World War II the Japanese launched nearly ten thousand balloons, each carrying 50- to 75-pound bombs. The last one was launched in April, 1945; two years before Roswell. These balloons traveled at an average speed of thirty-five miles per hour. At least one of them made it to U.S. shores. It was found by a family in Oregon who was out camping. The bomb exploded and killed six people. These were the only people killed on American shores due to a war-time attack. (Pearl Harbor and the Hawaiian Islands were not a state in 1947.) After that the military made sure everyone knew of the existence of these bombs. Once again, the handling of the Japanese balloon-bomb case was in complete contrast to the military' s behavior in handling the Roswell incident. One more note. In order for Roswell to be the result of a Japanese balloon bomb, the balloon would have had to stay aloft for two years and then miraculously land within a few miles of the world' s only nuclear air base.